Added Properties views for track and timeline when selected. Click track head to select track; click the timeline's cornerstone (top left block) to select the timeline. All of the new video filters are intended to facilitate chroma keying; however, the Alpha Channel filters do have some general usefulness outside of keying. 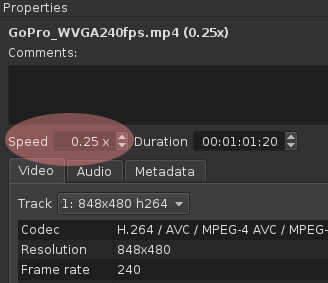 Please note that “Alpha Channel: View” is not really intended to be an effect that gets baked into your rendered and encoded output. You can leave it in the filter list, but toggle the filter by clicking the checkbox or double-clicking its name in the list of attached filters to turn it off. “Key Spill” is also know as “color spill” and “spill suppression,” and it refers to the background color bleeding into the foreground. None of these new video filters can utilize GPU-processing at this time; however, they do support multi-core rendering when Settings > Realtime is turned off or when exporting. You can use them in conjunction with GPU processsing; they just will not take advantage of the speed and quality the GPU mode provides.